Mrs. Ethel C. Allen, 86, passed away Wednesday, March 20, 2019. She was born in Helena, GA to the late Willie Coleman and Pearl Howard on November 25, 1932. 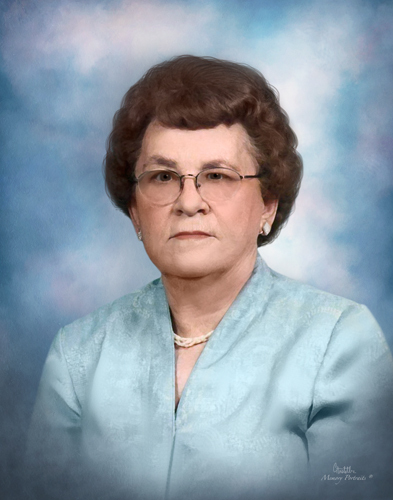 In addition to her parents, she was preceded in death by her husband of 52 years, Rufus; her oldest son, Glenn; her sister, Alice Evans and her brother, W.C. Coleman. She graduated from Chauncey GA High School in 1949. Surviving to cherish her memory are her daughter, Sue Kilgore (John); sons, Don Allen (Charity) and Jerry Allen (Amy); 7 grandchildren, Melody Thomas (John), Brandon Allen (Claire), Eric Allen (Cassandra), Dylan Allen, Christopher Kilgore, Lindsay Anastas-King (Grant), Jeremy Kilgore and Logan Allen; 4 great grandchildren,Jackson, Wyatt, Emma and Colton; 2 step great grandchildren, Braydn and Emma; nieces, Shirley Hall (Harry) and Sherry Maness (Tommy) and a nephew, Toby Evans (Trisha). She was a dedicated and faithful member of Sumner Baptist Church in Greensboro for 52 years serving as church clerk all of those years, sang in the choir, was Sunday School secretary as well as serving on a variety of major committees. She worked as the book buyer at Wills Book Store in Greensboro for 42 years, a job she really enjoyed. She loved the opportunity to meet so many authors and go to the Booksellers Convention every year. After retiring from Wills Book Store, she worked part time at Belks at Four Seasons Mall because she enjoyed working and being around people. She grew up and went to school with Daddy, dating each other as teenagers. They married in 1950 and moved from Helena, GA to Greensboro, NC. They had 4 children and were married for 52 years before Daddy went to be with the Lord 17 years ago. Though she loved her church and her job at Wills, her biggest love was her family, especially her grandchildren and great grandchildren who brought so much joy to her life. She loved our family get togethers, especially at Thanksgiving, Christmas, Easter and our annual Easter Egg Hunt at her house and our family cookout\lake get togethers every summer. She always wanted to know what the grandchildren were doing and where they were. She was so proud of each one of them. She was the last one living from her generation and she had a huge welcome home committee when she arrived at her new home in heaven to help her celebrate. Services to celebrate Ethel’s life will be held Saturday, March 23, 2019 at George Brothers Funeral Service with visitation at 1:00 and the service starting at 2:00. Interment will follow in Lakeview Memorial Park.